Aquatrols valves are factory set, tested, sealed and tagged to service your specific application. Air, Steam, Gas or Liquid. The pressure relief or pop off point are set in accordance to safety and capacity requirements. When a single pressure relief device is used, the set pressure marked on the device shall not exceed the maximum allowable working pressure of the vessel. Each pressure relief valve on air, water at the valve inlet that exceeds 140�F (60�C), excluding overpressure or relief events, or steam service shall have a substantial lifting device which when activated will release the seating force on the disk when the pressure relief valve is subjected to a pressure of at least 75% of the set pressure of the valve. 1. The user has a documented procedure and an associated implementation program for the periodic removal of the relief valve for inspection, testing, and repair. 2. The user specifies that no test lever be supplied. The user shall obtain permission to omit the lifting lever (device) from the authority having jurisdiction over the installation of pressure vessel. These rules apply to valves installed in ASME Section VIII applications. All valves used in ASME Section I (Boiler) applications require lifting levers except for those valves used in organic fluid vaporizer service. Aquatrol's Series 69 has the option of a handle wheel for field adjustments. Inlet and outlet sizes. Industry standards are Male Inlet and Female outlet. Please specify if otherwise. Space or the valves physical size may also be a consideration. Refer to each listing for sizes, capacities, pressure settings and applications. See individual valves for information on ordering. Contact us for further information or to order by phone, email, or mail. 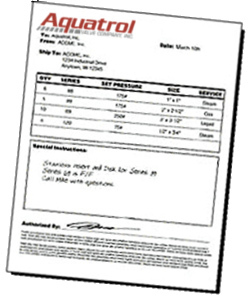 The set pressure tolerance for pressure relief valves shall not exceed +/- 2 psi for pressures up to and including 70 psi and +/- 3% for pressures above 70 psi. Aquatrol Valves are interchangeable with major safety valve manufacturers. Contact us for further information. The pressure relief valve capacity for each boiler shall be such that the pressure relief valve, or valves will discharge all the steam that can be generated by the boiler without allowing the pressure to rise more than 6% above the highest pressure at which any valve is set and in no case to more than 6% above the maximum allowable working pressure. Other than unfired steam boilers, when a pressure relief device is provided, it shall prevent the pressure from rising more than 10% or 3 psi, whichever is greater, above the maximum allowable working pressure. It is important to not oversize a relief valve by to much. Typically, this will result in valve chatter or rapid opening and closing of the valve disk. If chattering is present, it could be more economical to use two valves. Contact us if you have any questions or concerns about valve sizing.